Each resource page contains a menu and search filters that let you filter and sort the list of resources you have access to. In addition to viewing the list of resources on your screen, you can also export the list of resources as a CSV file (readable in spreadsheet programs such as Microsoft Excel). The CSV file contains the resource name, owner, the date created, and the file size of the resource. Depending on the type of resource, there may be additional fields. Navigate to the Environments, Templates, or Assets page. For example, click Environments > Environments. (Optional) Use the sort options to organize the list of resources. Click Export CSV. The report compiles and then downloads. 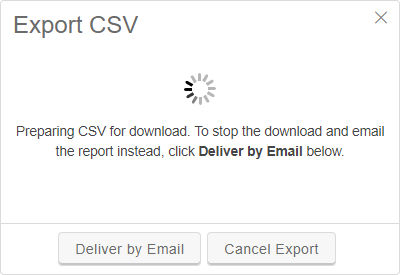 If you need the full report but don’t want to wait for it to compile, click Deliver by Email. The report is generated offline, and then a link to the report is emailed to the address associated with your user account. NOTE: Dates and times are displayed in the local time zone selected in your user settings. First and last name of the user who owns the environment. Date and time the environment was created. Number of virtual machines in the environment. Number of SVMs Skytap Virtual Machine units – A unit of measurement used to calculate virtual machine usage, based on the number of CPU cores and the amount of RAM (in GB) for a VM. The highest of these values determines the SVM value. For example, a VM with 2 CPU cores and 4 GB of RAM is calculated as 4 SVMs. To learn more, see How usage is calculated. consumed when the environment is running. Number of virtual networks in the environment. Amount of storage space consumed by the environment, in MB. Skytap Cloud region the environment is located in. Date and time a user last visited the Environment Details page for this environment, or made an API request to view the environment. Date and time the environment was last run. If the environment has never been run, the field is empty. Power state of the environment. One of running, suspended, or powered off. URL for the environment. For example, https://cloud.skytap.com/configurations/123456. First and last name of the user who owns the template. Date and time the template was created. Number of virtual machines in the template. Number of SVMs Skytap Virtual Machine units – A unit of measurement used to calculate virtual machine usage, based on the number of CPU cores and the amount of RAM (in GB) for a VM. The highest of these values determines the SVM value. For example, a VM with 2 CPU cores and 4 GB of RAM is calculated as 4 SVMs. To learn more, see How usage is calculated. in the template. SVMs in templates don’t count toward your concurrent SVM or SVM hours limits. Amount of storage space consumed by the template, in MB. Skytap Cloud region the template is located in. Date and time an environment was last created from this template. If an environment has never been created from this template, the field is empty. Power state of the template. Either suspended or powered off. URL for the template. For example, https://cloud.skytap.com/templates/123456. Login name of the user who owns the template. Date and time the asset was created. Amount of storage space consumed by the asset, in MB. Skytap Cloud region the asset is located in. Date and time the asset was last used. If the asset has never been used, the field displays the date and time the asset was created. URL for the asset. For example, https://cloud.skytap.com/assets/123456.